Steve Carell steps away from the comedy genre to play John DuPont, the disturbed heir of the DuPont chemical empire in the true-story drama Foxcatcher. 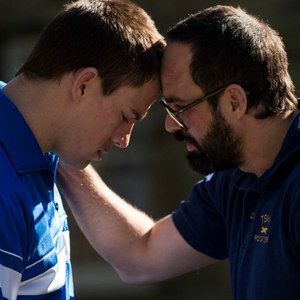 The first trailer has arrived for director Bennett Miller's drama, which follows brothers Dave Schultz and Mark Schultz (Channing Tatum and Mark Ruffalo), two Olympic wrestlers who train at John DuPont's facility, although their relationship ended in tragedy with John murdering David in 1996. Take a look at the first footage from this upcoming drama, arriving in theaters December 20.